Home ❯ Wedding Advice ❯ Lifestyle & Relationships ❯ Engagement Dilemmas – Solved! Nothing in life is straightforward, even getting engaged! If you’ve got questions about engagement etiquette, chances are you’re not alone. We come to the rescue, answering the most often asked questions – all you have to do now is think of the perfect place and time! Should a woman ever propose? Tradition has it that ladies can propose on 29th February each Leap Year, a custom that originated several hundred years ago, when the day was considered legally ‘invalid’. Conventions were turned on their head and women could take advantage of the opportunity to propose. Nowadays, women aren’t even waiting for a Leap Year! If you think you and your man are set for life, there’s no reason why you shouldn’t pop the question! What if you hate the engagement ring? Can you propose without the ring? Up to you. Historically, the man would get down on bended knee and whip out a few rocks on a band of gold. Nowadays, the couple is more likely to choose the ring together. A ring pull from a can will do at the crucial moment! You may feel that a proposal isn’t a proposal without a ring to hand over, in which case you need to get out there and buy one. Get one of her best gal pals to entice her to try one of her rings and to pass on comments about whether it fits, is too big, etc. Is she a deep sleeper? Get a length of string and wind it once around her ring finger, then mark the string with a pen. ‘Borrow’ a ring you know she wears on her ring finger and sneak off to the jewellers. Don’t forget that if you do get a ring ahead of time and it’s not the perfect fit, you can always get it altered. Shall I postpone the engagement if I can’t afford the ring? Let’s face it, there’s no point in breaking the bank for an engagement ring you both know you can’t really afford. But who says you need one anyway? Put the money you would have spent on it into a fund for the down payment on your first house and promise each other that just as soon as the bank balance is looking healthier, you’ll invest in a really indulgent piece of jewellery for her. If you feel really strongly that an engagement ring is essential, you could ask your parents for some financial help on this one. They may even have a family ring hidden away, gathering dust and ready to solve all your problems. Some couples choose to buy an inexpensive ring for the happy bride-to-be as a prelude to the proper multi-carat rock, which can then be purchased at the same time as the wedding rings. Can a guy wear an engagement ring? Why not? If you wish to show the world that you are engaged by wearing an engagement ring, who is going to stop you? Sure, you might get some odd looks as you simper, ‘look at my engagement ring’, but if you’re an original kind of person, this shouldn’t stand in your way. Traditionally, a signet ring was given to the groom by the bride and this is a nice way to mark the occasion. Do I have to ask my future father-in-law before I propose if we don’t get on? No, you don’t. But you should. If you’re going to become a part of her family, it’s worth starting off married (or engaged) life on the right footing with her folks. Her dad has, presumably, brought her up and helped to mould her into the amazingly wonderful person she now is. You owe it to him to prove that you’re worth her, and it would be great to swallow your pride and humbly ask him for his consent in your marriage. She’ll be more thrilled than anyone. You can always do this after you’ve asked her, of course. If you are asking her parents first and in secret, be sure to tell them the future bride doesn’t know yet – it will save a huge potential embarassment! We have heard stories of the bride’s mother calling the bride right after the visit from the future groom to congratulate her – potentially spoiling the upcoming proposal! So in case her parents don’t ask – make it clear that you have asked them first and to keep it to themselves for now. Is an engagement party essential? Of course not. Chances are, as soon as you’ve decided to wed, you’ll be planning the big day flat-out and may not fancy getting your head – or wallet – around organising ANOTHER party. If the engagement is going to be particularly long though, it’s a nice idea to celebrate the beginning of it with a party. There’s no reason why you couldn’t ask friends and family to come around to your place with a bottle, or just meet up in the local pub to celebrate your good news. How do you announce an engagement in a national newspaper? The engagement is announced between Jeremy David, eldest son of Mr and Mrs Thomas Snookesbury of Stourbridge, West Midlands, and Isabella Bertha Winterbottom, middle daughter of Mr and Mrs Rory Winterbottom of Salterton, Wiltshire. However, the conventions these days allow for modifications to the standard wording, so feel free to personalise your announcement, as long as it fits the newspaper requirements! Do the bride’s parents and groom’s parents need to meet straight away? It is traditional for the groom’s parents to ‘call on’ the bride’s parents soon after their children have decided to marry, but it doesn’t always happen these days. Generally, the parents will meet at some stage during the engagement (rather than for the first time at the wedding), but engagements these days are longer and there doesn’t seem to be any hurry to make the introductions. It’s a nice idea, though, to arrange a get-together as soon after the engagement as possible. In fact, this is one of fabulous options for a fabulous engagement party – arrange for a joint party, with equal contributions from all (the future newlyweds, and both sets of parents), so everyone can meet in a merry environment. Another great option is to celebrate an upcoming occasion together – such as Christmas, the bride or groom’s birthday, or a wedding anniversary of either parents. Does the bride-to-be buy her groom-to-be an engagement present? This is a great idea and a lovely way to celebrate your union – after all, he’s just splashed out on that gorgeous ring! Why don’t you arrange to go out for dinner/brunch for the last time as fiance/fiancee and give him your gift then? It doesn’t have to be a huge present to really mean something. A home-made tape of all your special songs would be a great gift to give at this stage in the run-up to the big day. Watches have traditionally been given by the bride to the groom, but, as with everything else in the world of weddings, it’s your call. 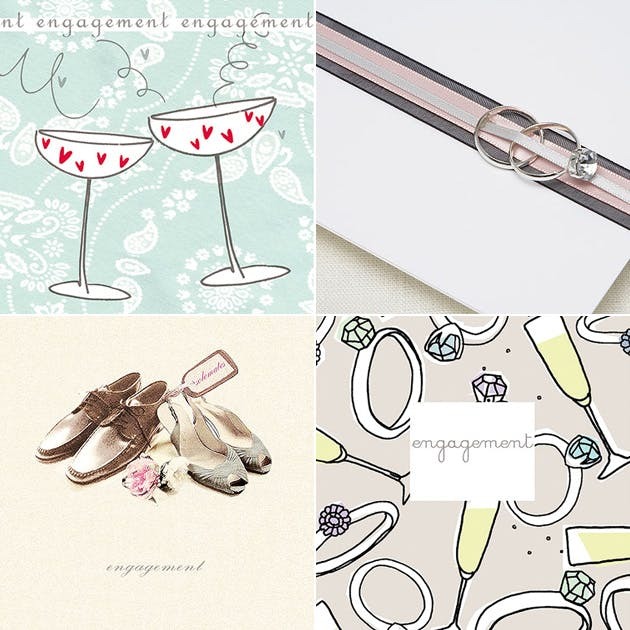 You’ll find lots of great advice on our Engagement pages!